Outline After receiving a new TV as a gift from a grateful pawn shop owner, Sam, Dean, and Castiel find themselves teleported into an episode of Scooby-Doo, Where Are You! where they must help the Scooby Gang to stop the ghostly apparition hunting them. Sam and Dean are in a fight with a green dinosaur plushie in a pawn shop. As Sam struggles with the plushie on the floor, Dean takes out a canteen of holy oil and pours it on the plushie and ignites it, causing it to explode. A man, Alan, appears from behind the counter, asking if it is over. Sam and Dean reassure him, when in walks a business owner Jay, who asks what happened. After Sam and Dean explain that a defective product exploded, Alan offers the Winchesters whatever they want in the store. Sam attempts to politely decline, but Dean decides to grab a large flat screen TV. Back at the Men of Letters Bunker, Sam is researching cursed objects to try and figure out what they just fought. Dean excitedly enters the library and asks Sam to come with him. After some prodding from Dean, Sam agrees and is taken to the Dean-cave -- a recreational room Dean has made in the Bunker featuring foosball, a jukebox, a bar, two La-Z-Boys, and the TV. Dean points the remote at the TV, which begins to light up purple before Sam and Dean are hit with a beam of purple light that pulls them into the TV. Quickly realizing they are cartoons, they question what happened. When Dean sees the Impala has been animated as well, he suggests to Sam they work the case and drive until they find something. They stop at a malt shop, pull in, and park. The van next to them in the lot is not just any van -- it's the Mystery Machine from Scooby-Doo, Where Are You!. They enter the malt shop only to see the Scooby gang dancing at a jukebox. Dean named them all off. Fred, Shaggy, Daphne, Velma, and Scooby. The gang sits, Dean introduces themselves and asks if they could sit with them. Fred agrees and they sit down. Dean kisses Daphne's hand. She is his crush. The gang is talking about a Colonel Saunders has left Scooby in his will and he has to be there for the reading. Scooby had saved his life in a fish pond. And the Colonel was grateful. Dean asks if he and Sam could tag along. They were okay with that. Shaggy, Scooby, and Dean have a very large sandwich before they leave. Parked at a traffic light. The Mystery Machine and the Impala side by side. Dean wants to race him and thinks the van is too slow. Fred driving leaves the Impala in the dust. Dean is mad and spins his tires. And they are gone. A figure in a long coat appears. They are all at a mansion. Dean realizes the episode they are in. A Night Of Fright Is No Delight. He is excited. He's seen it a million times. The attorney introduces himself and points out those who are in the will - the relatives and Scooby Doo. He plays a vinyl record that the colonel had left his last wishes on. The instructions are that all had to stay the night in the mansion to inherit the million dollars. He mentions the mansion is haunted. Whoever was left in the morning would inherit the money. The attorney leaves with an evil long laugh. They all settle in for the night. The girls in their room and the men in theirs. Daphne rejected Dean's request to share a room. Fred, Shaggy, Scooby, Sam, and Dean are in their room. Dean is wearing a long nightshirt with a cap. Sam questions him wearing it. In the meantime the girls are talking about Dean and Sam. While they all relax in the hallway is a ghost with glowing eyes and chains. Cousin Simple is attacked from behind with a knife. Dean is about to eat his sandwich when they all hear a scream. All run downstairs to a room where, in a bed, Cousin Simple has been stabbed and died in his bed. They all decide to look for evidence and Velma takes over the investigation. She again says she doesn't believe in ghosts. From the large window, a shadow of a man is seen. He enters the room via the window, it is Castiel. Dean introduces him to all of them as his friend. Cas begins to tell his story of how he got there. In real life, he is seen coming down the stairs with a bag of fruit from the tree of life. No one responds to his calls. He winds up in the Dean-cave, where he sees the TV. He sees Sam and Dean on TV as cartoons. A purple energy pulls him into the television. He appears as the Impala speeds up the road. The lights begin to flicker. Doors slam in the hallway. A ghost appears Fred runs to it, he just passes through it. The ghost leaves claw marks on the wall Scooby is in Shaggy's arms and Shaggy is in Cas's arms. Fred finds a door and opens it to find Cosgood Creeps dead and in pieces. It is gruesome. Fred thinks they should spread out and search for clues. They all pair off. Of course, Dean is with Daphne and Fred. Sam and Velma search the attic. He gets spooked by a mannequin. Sam tells her about ghosts, demons, and monsters. She is amused by it. She has a crush on Sam. They come to a chest full of toys and ectoplasm. Suddenly, the toys begin to hurl at them. They leave quickly. Fred, Dean and Daphne are in the library looking for clues. Dean sees a yellow book that is out of place. He pulls it out and the trap door opens, they fall into the basement. The room is dark. Fred turns on the light and they see the ghost. 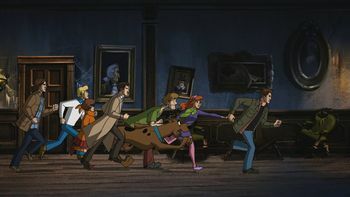 Shaggy, Cas, and Scooby are walking in the mansion, the ghost is behind them. They see it and run. Cas confronts it, there are purple sparks. The Scooby Doo theme song plays at this point as the characters all run away from the ghost. They pop out of urns, where Deans tries to steal a kiss from Daphne. After they crash into one another, they back into a room. Velma again takes over and declares she does not believe in ghosts. She see her breath, her glasses get icy as does all the glass in the room. The ghost enters the room in darkness. Fred runs toward it and is thrown to the wall. Daphne and Velma are levitated in the air. Shaggy is thrown out the window, where he is holding on to a pole outside. He falls Scooby grabs him and Cas grabs his tail. They fall to the ground. Shaggy has broken his arm. Velma puts a splint on his arm and Daphne uses Fred's ascot for a sling. Dean tells them that ghosts are real. They have a hard time believing that. They're very upset. So Dean mentions their accomplishments from other episodes. This helps them calm down. Dean and Sam are in the car's trunk getting weapons for their fight. Scooby and Shaggy set up an elaborate trap, with coconuts, iron chains, and a washing machine. The ghost comes in and it goes all wrong. The three of them get caught up in the trap. Plan B is to get it into the library. The ghost falls into the basement in a circle of salt. He can't get out. Then it turns into a little boy. The boy explains that when he died, his soul was tied to a pocketknife. Jay, from the pawn shop, found a way to control his spirit and use him to hurt people. Dean asks if he can get them home, if he can he will release him from the knife. The both peek out the door and see the gang upset. They emerge telling them that Velma was right it was not a ghost. They come in to see the attorney Cosgood Creeps wrapped up in the circle of salt. Dean comes in with a suitcase with the cash, it is Confederate money -- worthless. Cas touches Shaggy's arm and heals it. Dean says goodbye to Daphne. Cas hugs Scooby and Shaggy. Velma shakes Sam's hand then pulls him down into her arms and kisses him. The three of them return to the room with the boy. He snaps his fingers and they are back in the Dean-cave with the TV. Dean gets a sledgehammer and destroys the television. They find the knife, Sam burns it with a blow torch and the boy disappears. Back at the pawn shop. Alan has papers to sell his business to Jay. He hesitates at that point Dean tells him not to sign. The three of them are there. Sam tells Alan what Jay has been up to to get his property. Cas shows the pen knife and that the spirit is free now. They also mention Jay's tax evasion, at that point, the police are outside. He is arrested and taken into custody. Dean in his red ascot, like Fred's, does his Scooby Doo impression. Dean: That's the Mystery Machine. We're not just in any cartoon. Sam: Great. So we're stuck in a cartoon with a talking dog. Dean: Not just any talking dog, the talking dog. The greatest talking dog in history. Now come on! Dibs on Daphne. Dean: Oh, man. This is like a dream come true. Sam: Your dream is to hang out with the Scooby Gang? Dean: Sam, growing up on the road, no matter where Dad dragged us, no matter what we did, there was always a TV. And you know what was always on that TV? Scooby and the gang. These guys, they're our friggin' role models, man. Except Fred, he's a wad. Dean: Just think about it -- we do the same thing. We go to spooky places, we solve mysteries, we fight ghosts. Sam: Yeah, except our ghosts don't wear masks, and we don't have a talking dog. Dean: I don't know. I mean, Cas is kinda like a talking dog. Dean: Dude, this is not the way things went down in the episode. I remember everything that happened in Scooby-Doo, and no one ever got stabbed in the back and ended up in a pool of their own blood. Sam: Yeah. Yeah, okay. Um, so, if that guy can die for real in this cartoon, that means we can, too. Dean: It doesn't matter if we die. Scooby-Doo could die! And that's not happening, not on my watch. I'd take a bullet for that dog. Castiel: Sam? Dean? I'm back from Syria with fruit from the Tree of Life. The tree was guarded by a pack of djinn. I killed most of them, bargained with the rest. Think I'm... technically married to their queen now. Sam: Look, I'm not supposed to tell you this, but ghosts are real. Sam: My brother and I, we hunt them, along with werewolves and vampires and demons and... We've saved the world. A lot. Velma: Look, Sam, the simple fact is monsters are nothing more than crooks in masks -- usually unscrupulous real estate developers. Sam: Look, that isn't a guy in a mask and a costume. It's a vengeful spirit that's come back from the dead. Velma: So everything you told me, it's true? Velma: I thought I was blind without my glasses, but I was just blind. Oh, how could I be so stupid? Fred: We've been stopping real estate developers when we could have been hunting Dracula? Are you kidding me?! My life is meaningless! Daphne: If there are ghosts... that means there's an afterlife. Heaven. Hell. Am I going to Hell?! Shaggy: We told you every freaking time. But did you ever listen to Scoob and me? No! Fred: Dean, we've gotta do something. I mean, you guys are amazing! Fred: But we can help. We have to. Dean: F^#%ing right you can. You're gonna do what you do best -- build a trap. Sam: Okay. That was... something. Dean: That was the coolest thing that's ever happened to me. And that includes the Cartwright twins. Castiel: What did you do with the Cartwright twins? Dean: Oh....ha heh... I'll be right back. Sam: I don't think I wanna know. Sam: Ha! Velma was right. It was a shady real estate developer after all. Jay: It's not fair. I would've gotten away with it if it wasn't for those meddling kids. Dean: He said it! He said the line! Scooby Dooby Do! Castiel: Dean, you're not a talking dog. Dean: No, but come on, I-I do look cool with the ascot, right? No? Guys? Come on, guys. Look, red is my color! The episode is based on the 1969 first season episode of Scooby-Doo, Where Are You! "A Night of Fright Is No Delight". Sam: Defective product. Yeah, sometimes the batteries in these... giant stuffed dinosaurs just explode. Dean: Yeah, never buy anything from Moosylvania. Moosylvania is a fictional island that served as a plot device in the animated show The Adventures of Rocky and Bullwinkle and Friends. According to writer Jeremy Adams, the characters of Alan and Jay are named after Warner Bros. Animation producer Alan Burnett and WB Animation executive Jay Bastian, respectively. Barney is the purple anthropomorphic Tyrannosaurus rex star of the PBS series Barney & Friends. Dean: Dude, it's over. All right? Be like Elsa -- Let it go. Dean is referencing Queen Elsa of Arendelle from the film Frozen, who sang the song "Let It Go" in the film. Dean: Behold... The Dean-cave. Or Fortress of Dean-a-tude. Just -- still trying to figure that one out. We got foosball. We've got jukebox -- all vinyl, obviously. Double La-Z-Boy recliners. And, of course, the bar. Still a work-in-progress. It's gonna have a kegerator because... Well, it's gonna. And finally... the pièce de résistance. "Dean-cave" and "Fortress of Dean-a-tude" are both reference to the secret lairs of Batman and Superman, respectively known as the Batcave and the Fortress of Solitude. Using the Fortress of Solitude to nickname his man cave is also a reference to the famous comedy sitcom How I Met Your Mother where one of the main characters Barney Stinson calls his apartment the "Fortress of Barn-itude". "Sunrise" (from "Also sprach Zarathustra") plays as Dean is turning on the TV. This is a reference to the scene when the same music plays in 2001: A Space Odyssey as the apes are worshiping the black monolith. Dean: Hey, you wanna pull that stick out of your... nether regions and just play along here? Sam: Play... There are no words in this newspaper, Dean. We should be trying to get out of here and instead you -- you're hanging out with Marmaduke. Sam: And hitting on Daphne, when she's clearly with Fred. Dean: She's settling, all right? Oh, Daphne could do so much better. Marmaduke is the star of the eponymous Sunday morning comic strip. Like Scooby-Doo, he is a Great Dane, though nobody can tell him what to do. Cosgood: Attention, everybody. As you all know, I am Cosgood Creeps, attorney of the late Colonel Sanders. While Colonel Harland Sanders is the founder of the Kentucky Fried Chicken restaurant chain, the character in the original episode was named Col. Beauregard Sanders. This may also be a possible reference to Asmodeus, whom the fandom calls Evil Colonel Sanders. The Scooby Gang and Dean each speak their catch phrases. Shaggy: Like, man, I guess that leaves me and old Scoob with you, Castiel. Castiel: Wonderful. I once led armies, and now I'm paired with a scruffy Philistine and a talking dog. Philistine is a derogatory term for an uncultured person. 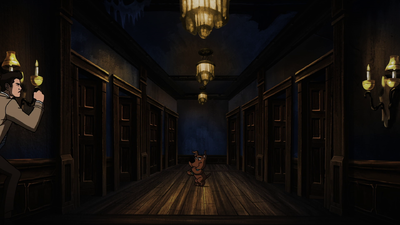 During the classic Scooby-Doo chase scene, Scrappy-Doo can be spotted running from one room to the next. Scrappy-Doo was introduced as Scooby's nephew and his inclusion in the cartoon series in 1979 to boost falling ratings is considered a "jump the shark" moment. Shaggy: You've got me! Who's got you?! The same lines were spoken by Lois Lane in 1978's Superman when she was rescued by Superman after falling from a helicopter. Watch the scene here. Castiel: It appears his arm is broken. Shaggy: What? That's not -- I have jumped out of a biplane in a museum and was fine! How did this happen? Shaggy is describing an incident from the first Scooby-Doo, Where Are You! episode "What a Night for a Knight". Dean: All right, knock it off! Come on! Scooby Gang does not have nervous breakdowns. Now you may not have tangled with the supernatural, but you've fought monsters, real freakin' psychos. Well, you stopped Zeke and Zeb. Shaggy figured out that the sharks Old Iron Face rode were really just torpedoes disguised to look like sharks. And what about the Black Knight? Huh? Mamba Wamba? Dean: I knew it! You love this show, too. Dean: Space Kook, Ghost Clown, Miner 49er. You guys have all jumped into danger with no thought for yourselves. You're heroes, and together, we're gonna take down this phantom. Are you with me? Zeke and Zeb appeared in "Which Witch Is Which? ", Old Iron Face appeared in "The Creepy Case of Old Iron Face", the Black Knight appeared in "What a Night for a Knight", Mamba Wamba appeared in "Mamba Wamba and the Voodoo Hoodoo", the Space Kook appeared in "Spooky Space Kook", Ghost Clown appeared in "Bedlam in the Big Top", and Miner 49er appeared in "Mine Your Own Business". Fred would often set up complex machines in an attempt to trap the villain of the week. These contraptions are known as Rube Goldberg machines. In Scooby cartoons, as Dean notes, they are rarely successful in catching their prey. Daphne: Kill it with fire! "Kill it with fire" is a popular expression for destroying something with extreme prejudice. Dean: Right. But the joke is on him because the money's worthless. It's all Confederate dollars. While not legal tender, Confederate currency does have collector value. Sam: Turns out you're not so big on paying your taxes, are ya? Dean: Good enough for Capone, good enough for you. American gangster Al Capone was arrested for tax evasion in 1931. As Jay is being led away in handcuffs, the writing on the cop car says "Crystal Cove Police." Crystal Cove was the hometown of the Scooby Gang in the 2010-2013 series Scooby-Doo! Mystery Incorporated. Check out the entry Scooby-Doo, Where Are You! for previous references to the Scooby Gang, including Dean's crush on Daphne Blake, on Supernatural. The episode was previewed to the audience at Paley fest on March 20, 2018, with an Impala and the Mystery Machine along with Scooby-Doo present outside the theatre before the event. Frank Welker has been voicing Fred Jones since the very beginning of Scooby-Doo, Where Are You! in 1969. As production for the episode began during season 12, Castiel is wearing his striped tie outfit from seasons 9-12 due to production being unaware he would be getting a costume change in season 13. The title card was altered for this episode. Starting from the typical Scooby-Doo, Where Are You! opening, it quickly cuts to an animated version of the season 13 title card, with "Scoobynatural" replacing "Supernatural" and Scooby-Doo laughing along with the supernatural noises. There is a mini-Mystery Machine hidden in every live action scene. It first appears on top of a record player near the entrance in the pawn shop, it next appears in the Dean-cave on a shelf next to some albums. Sam: This is, uhh... You saw that light. D-did we just get sucked into the TV? Dean: Or maybe this is just an angel thing. Or -- or the Trickster. A meta reference to the fandom's divided beliefs on whether Gabriel was actually killed by Lucifer in 5.19 Hammer of the Gods, which was further fanned in 9.18 Meta Fiction as well as the fact that Gabriel was shown to be alive in 13.13 Devil's Bargain as a prisoner of Asmodeus. Dean: Last time we got zapped into TV, we got out by playing our part. This is probably like that. The gang, they're about to get a mystery. Reference to 5.08 Changing Channels. Post-production coordinator Mary Manchin did the voice of the waitress who serves Scooby the milkshakes and gives the Scooby Gang their sandwiches. Dean had previously commented on needing a bigger mouth for a Dagwood sandwich in 5.08 Changing Channels. 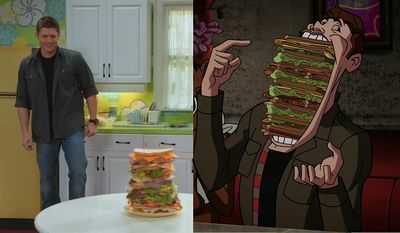 He is finally able to achieve his dream of eating a comically large sandwich in "Scoobynatural". Dean: Yeah, creepy ghost kid. You get used to 'em. Sam and Dean have dealt with "creepy ghost kids" in 4.02 Are You There, God? It's Me, Dean Winchester, 4.15 Death Takes a Holiday, 5.09 The Real Ghostbusters, and 12.03 The Foundry. The sound of a child screaming can be heard mixed into the roar of the dinosaur in the pawn shop; along with the non-dusty toys covered in ectoplasm in the attic, these hint at the true nature of the Phantom. Jared and Jensen announce the "Scoobynatural" episode at the Upfronts in New York in May 2017. Jared, Jensen and Misha with Scooby before the Paley fest panel. Scoobynatural is named in TV Guide's top 25 episodes of TV in 2018. This page was last edited on 22 March 2019, at 01:14.